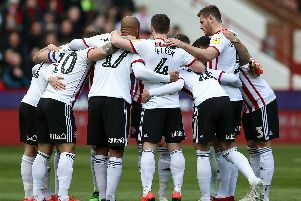 Nigel Clough, the Sheffield United manager, had warned beforehand that this afternoon’s match at Highbury would be a huge test of character for his side. If the biting wind blowing across Fleetwood Town’s compact stadium was not challenging enough, then Graham Alexander’s players, Clough acknowledged, were likely to be intent on making the visitors’ first outing here an even more unpleasant experience. Kieran Wallace, making his United debut after leaving Ilkeston last month, knew he would remember it forever. Irrespective of the final result. But, bellowing instructions from the dug-out as early as the first minute, Clough left those within earshot under no illusions that three points, not personal landmarks, were his sole objective here. Despite his demeanour, United made a bright start with a delightful fifth minute exchange between Jose Baxter and Jamie Murphy ending with the latter shaving the near post with an angled shot. Chris O’Grady, whose fellow centre-forward Michael Higdon tried his luck from long distance soon after, was also making his presence felt in attack as he linked-up play well following a less than gentle reminder from Clough. But it was Bob Harris who enabled United to seize control of the fixture when he dispatched a superb, raking ninth minute finish into the bottom corner of Chris Maxwell’s net. With Ryan Flynn again deputising at full-back in Craig Alcock’s absence, Gareth Evans attempted to test his position sense almost immediately after the re-start. Flynn, though, shepherded his marker towards the touchline which meant Mark Howard was able to comfortably gather the resulting cross. Matt Hughes also tested the United goalkeeper’s handling from the edge of the area before Baxter and O’Grady both saw attempts blocked during a frantic period of play. Midway through the half, Murphy nearly intercepted Mark Robert’s back pass when Higdon harried the Town defender into a potentially costly mistake. The opening 23 minutes had been controlled by United but Alexander, who had spent most of the contest so far in consultation with his coaching staff, was at last beginning to look at little more relaxed. Fleetwood tried - and failed - to launch another drive forward. Jamie Proctor carved Fleetwood’s best chance when he wriggled into space in a central position on the edge of Howard’s penalty area but dragged a powerful shot wide. Immediately, Murphy forced Maxwell to parry with an even more rasping effort but Higdon miscued when the ball bounced back into play. United had impressed before the interval, demonstrating plenty of positive intent. However, they found themselves back on level terms just eight minutes after the re-start when Antoni Sarcevic’s looping header back across goal sailed over a stranded Howard from Morris’ high cross towards the far post. The hosts, who saw captain Roberts cautioned by referee Andre Marriner in the 61st minute, were infused with confidence as a result although Murphy’s dribble, which drew that challenge, tested their resolve. Jay McEveley was forced to prevent a low centre from Hughes reaching a team mate soon after before Maxwell blocked from O’Grady at the other end. Higdon glanced a header wide after outmuscling his marker on the edge of the six yard box to meet Harris’ cross. Had he not been off-balance, the end result would almost certainly have been different. In the 69th minute, Baxter was withdrawn when Chris Basham entered the fray. The Liverpudlian, whose exchange with Harris led to United’s goal, had done well but his team mate’s introduction lent some much needed presence to a midfield which was now being forced to cope with lots of opposition runs from deep. Wallace’s shot through the crowd was saved by Maxwell who also smothered a dangerous effort from O’Grady at the foot of the near post. Six minutes after Basham came on, Higdon swapped places with Marc McNulty before a hugely promising debut from Wallace came to an end. Florent Cuvelier replaced him in midfield before Howard made an excellent save to deny Sarcevic. United breathed a sigh of relief when, as the ball bounced loose, Hughes scuffed his shot. Nick Haughton was introduced at the expense of Evans for Fleetwood with nine minutes of normal time remaining. Murphy had been singled-out for some abrasive treatment by the home side and, in the 89th minute, Hughes was booked for scything him down as United countered. Clough urged everyone bar Harris and Howard forward when United won a last ditch corner but, when Marriner called proceedings to a half, the scoreline remained all-square. FLEETWOOD TOWN: Maxwell, McLaughlin, Andrew, Roberts, Evans, Hughes, Morris, Sarcevic, Proctor, Hughes, Jordan. Substitutes: Schumacher, Dobbie, T Davies, Haughton, Hitchcock, Bleeker, Cartwright. SHEFFIELD UNITED: Howard, Harris, Flynn, Doyle, Murphy, Baxter, McEveley, Higdon, McCarthy, O’Grady, Wallace. Substitutes: Basham, McNulty, McGahey, Campbell-Ryce, Turner, Adams, Cuvelier.